Despite a deluge and high winds, Fielding and Michael Bragdell swept all three classes entered at the recognized VADA-NOVA Spring Dressage Show at Morven Park in Leesburg, VA on April 11-12. A drenching, cold rain didn’t dampen this pairs’ enthusiasm for the task on Saturday – scoring 68% in 1st 3, and coming back later in the afternoon to score 67% in 1st 4. 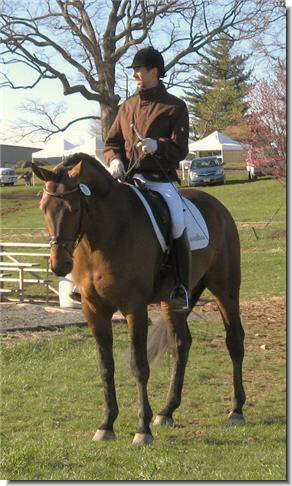 The sun brought cold winds on Sunday…and a third blue ribbon with a score of 66% in 1st 4. While the ribbons are nice, what was truly satisfying was getting to watch these two delight in each other’s company. Deep and tiring footing made no never-mind to this young stallion at the start of his competitive career. When Michael asks, Fielding steps up to the plate. Congratulations to both for a job very well done!